I remember a time when Maxell made some of the finest VHS tapes on the market. Maxell has obviously needed to make changes in order to stay in business. Maxell is now making many other products including iPod accessories, including three different types of headphones. 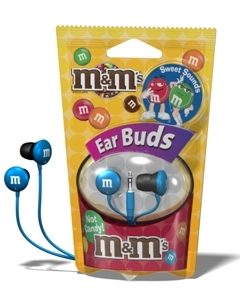 The first are the M&M’s headphones that have the image of the popular candy on each ear. These will be available in five colors including red, pink, blue, orange, and white. To celebrate this product’s release, four guys in giant M&M cosutmes hung around the Maxell booth at CES. It was a nice touch. The second is the Action Sports Headphones, which is everything that the name implies. These are headphones designed for the extreme or even non-extreme sports person. They are designed to withstand a lot of sweat, and can filter out unwanted sound. All three of these headphones will be available soon. The M&M Stereo Ear buds will be available for $9.99, the Action Sports headphones will range from $19.99-24.99, and the Kids Safe Ear Clips will be for about $12.99.